The frequency with which the police kill young Black men makes a couple of weeks seem like the distant past, and underscores the steep hill that the pushback against police violence and repression has to climb. For four days bridging the second weekend in August, Ferguson and the rest of the St. Louis metro area were the focus of that fightback. A coalition of 40 groups organized a series of events to remember Michael Brown and 1,000 other people killed by police in the United States in the past year, and to mark the one-year anniversary of the Ferguson uprising sparked by Brown’s killing. Under the slogan “United We Fight,” organizers consciously and specifically sought to bring progressive whites and the LGBT community into alliance with the Black community to grow the movement to end police violence and repression in the face of what they saw as an “unresponsive body politic.” They adopted a festival approach to organizing: instead of any one group insisting that everyone had to get behind their event, any group could participate in whatever way they felt comfortable as long as they promoted the whole festival of events. They made an effort to include a menu of events–family-friendly, community-building, and direct action–to expand their reach and bring more people into the movement. Protesters gather for a memorial service outside of the apartment complex where Michael Brown was shot. United We Fight leaders called on supporters nationwide to organize events in their own cities, if not on the same weekend, then during the month of August, in order to turn the month into a “Black August” of protests against police violence and repression. Still, people traveled to St. Louis from many other cities to take part in the United We Fight weekend. The Vonderrit Myer memorial march on Saturday drew a multiracial crowd of nearly 1,000 people. 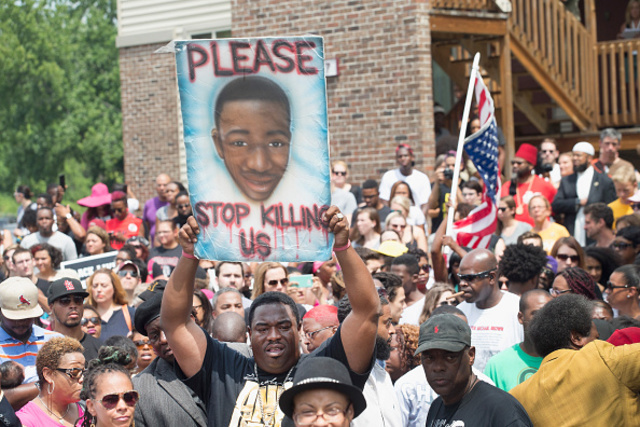 The Michael Brown memorial march drew over 1,000. In the lead-up to the weekend, the United We Fight coalition pressed the major police departments in the area to adopt new “rules of engagement” that would bar the use of chemical weapons on peaceful crowds. During the same period, there were numerous training sessions to prepare people for the possibility of police inciting confrontations. The National Lawyers Guild trained people to act as legal observers. WeCopWatch trained people in how to watch cops. Stlmedics and Ferguson Self Care offered medic and “street medicine” training. The Deep Abiding Love Project oversaw trainings in non-violent direct action. Throughout it all, trainers urged people to think seriously about what they did. They urged people not to post videos to social media without the permission of the people in them, because police and prosecutors scour those videos for anything that they can interpret as illegal activity. In the weeks following the commemoration, St. Louis County announced new charges against people involved in protests a year ago, based in part on what prosecutors saw in social media. Organizers also urged anyone thinking of participating in civil disobedience to consider forgoing bail and staying in jail for 24 hours, because bail money supports the very system they were trying to dismantle, while staying in jail makes the system absorb additional costs. In the end, between 150 and 200 people were arrested across different police jurisdictions. Fifty-seven were arrested after they blocked entrances to the federal building in downtown St. Louis. Another 70 were arrested after they blocked I-70 in both directions where it crosses the Missouri River between St. Louis County and St. Charles County. St. Charles is known as the area where white home-buyers fleeing block-busting in Ferguson and other north St. Louis County municipalities were funneled. It is a bastion of white separatism and racism famous for turning its back on “urban problems,” and notoriously voting against joining the regional transit system after a fear-mongering campaign promoted visions of Black men from St. Louis taking trains to St. Charles to pillage homeowners and taking trains back to St. Louis with their looted appliances. Despite the best efforts of organizers to use the anniversary of Michael Brown’s killing to launch a broad, unified progressive alliance against police violence and repression, no national political leaders showed up to stand in solidarity with victims of government violence. Some local politicians attended, including some St. Louis city aldermen and the mayor of Dellwood, a small municipality that borders Ferguson, but no candidate for president expressed solidarity with the movement that weekend, either physically or verbally. Instead, the corporate news media and many pundits seized every opportunity to sow discord in the movement. In the tradition of classic slurs on democracy, editors at the metro area’s one daily newspaper tried to fit the “eclectic” array of activities into a narrative that said it was hard to know what the movement wanted, since it “lacked a single leadership or unified theme.” When two Black Lives Matters protesters disrupted Bernie Sanders’ speech in Seattle on United We Fight weekend, some white liberals were deeply offended. The media fanned the flames of that offense and ran with a story that Black and white liberals were at each other’s throats. When police shot a young man in a protest area in Ferguson the night before of “Moral Monday,” purportedly in response to gunshots fired at police, the St. Louis County police chief showed that he had absorbed lessons about splitting his opponents. Instead of labeling protesters as law-breakers, he said that protesters had nothing to do with the confrontation. “They were criminals. They were not protesters,” he said, seeking to split the protesters from the shooting victim while simultaneously painting the police as tolerant of dissent and justifying the shooting of a young man by labeling him a criminal. 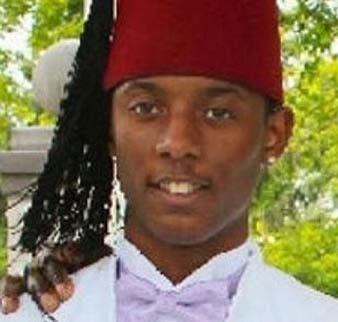 Less than two weeks later, St. Louis Police shot and killed another young man. When young people gathered in anger, the police turned to chemical weapons, even gassing an ice cream truck serving children. The police first claimed that Mansur Ball-Bey, a FedEx worker, was pointing a gun at officers, but an autopsy showed he was shot in the back. Ball-Bey’s family says he was a bystander waiting for a ride home from his brother, when police raided a house nearby in a search for drugs. A day before Ball-Bey’s killing, a nine-year-old girl was killed in Ferguson when someone fired a gun through her bedroom window. Her name was Jamyla Bolden. Leaders of the Ferguson uprising, including activists in Black Lives Matters and Tribe X, a group formed by African-American college students who met last year during the Ferguson uprising, reached out to the Bolden and Ball-Bey families to offer their support. Notwithstanding important differences between individual violence and state-sponsored violence, leaders of the anti-racist movement recognized people who lose loved ones to violence morn regardless of the source of violence. They helped organize hundreds of people to attend a memorial service for Jamyla, spoke out against both her murder and Ball-Bey’s, and participated in protests against both killings. Fox News, however, falsely reported that they ignored Bolden’s killing and were only concerned with “criminals” like Ball-Bey. The African-American community is no more monolithic than the white community, and after a Black woman went on You Tube repeating the Fox News slurs, Fox News seized on it as proof that protestors against police violence don’t actually care about Black lives. Although police have said they have no idea who shot Bolden, news coverage has implied it was a Black gang member and put it in a narrative of “Black-on-Black” crime. As police don’t know who shot Bolden, however, any attempt to assign a racial identity to the killer is pure speculation. Yes, Black gangs operate in north St. Louis County, but white “Oath Keepers” have prowled the area with firearms, too, unmolested by police. And it was the St. Louis-based Council of Conservative Citizens (formerly the White Citizens Council) that inspired Dylann Roof to shoot Black church-goers in Charleston, South Carolina. At the moment, no one except the killer and perhaps a few close friends know the killer’s identity. Organizers of United We Fight lauded the Ferguson uprising as the longest struggle against police violence and repression, and the second longest civil rights struggle, in American history. As the ferocity of the media onslaught after the memorial protest and celebrations shows, however, the movement against racist police violence still has long road to travel and huge obstacles to overcome. The author is a writer and activist in St. Louis, MO.